» Have We Already Seen the Height of Pinterest? Have We Already Seen the Height of Pinterest? You can see there has been a trending decrease in search demand for “pinterest” since March 2012. But search demand doesn’t necessarily mean the fad has died, so lets take a look at how visitors are engaging with the site. Compared to Facebook and Twitter, Pinterest visitors are spending much less time on site than Facebook and starting to equal that of Twitter. 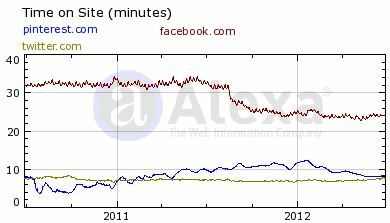 Perhaps the bigger story here is the decline of time on site for Facebook users – we’ll save that for another post. It’s interesting to see that the time on site curve is matching the search demand curve. I think this chart best illustrates how many companies are incorporating Pinterest with their website’s social sharing options and providing a link to their profile. 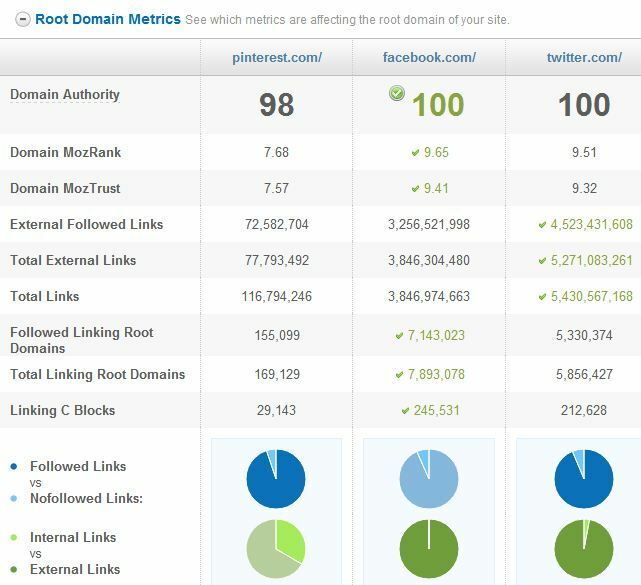 It is also amazing how quickly they were able to achieve a Domain Authority of 98! Perhaps we have experienced the end of the Pinterest craze and now demand is just leveling out, but this social network will no doubt be around for some time and many companies are finding great success incorporating a good Pinterest strategy. 3 Social Media Marketing Tools so You Can Set it and Forget it!